To promote intellectual and informative debate within the apicultural sector of Ireland by the organisation of Conferences, Seminars and Workshops for the wider beekeeping fraternity and general public. Over hundreds of thousands of years the Native Irish Honeybee (Apis Mellifera Mellifera) has evolved so that it is uniquely suited to survive and thrive in our cool and often wet climate. Although once common, the Native Irish Honeybee has in recent years seen a serious decline in population due to a combination of factors including the destruction of habitat (hedgerows and wildflower meadows), the use of chemical pesticides, the arrival of invasive species and the spread of diseases. If our Native Irish Honeybee was allowed to die-out, it would mean not only a significant loss in food production (as fruiting plants and trees could no longer be pollinated) but also the loss of many native wildflower species that depend on bees for pollination. Protecting the Native Irish Honeybee is therefore crucial to preserving entire ecosystems. The Connemara Beekeepers’ Association is working very hard to help conserve the Native Irish Honeybee. Through our breeding programme we have helped develop honeybees which are docile and easy to handle, resistant to disease, produce a large honey-crop and are uniquely suited to survive in the difficult conditions of Connemara. We have also collaborated with universities in scientific research programmes designed to develop our understanding of the Native Irish Honeybee. It is hoped that in the future Connemara may be established as a special area of conservation for the Native Irish Honeybee. However, this important conservation work is threatened by the arrival of invasive honeybees into the area. Stocks of non-native honeybees may be purchased by inexperienced beekeepers in the mistaken belief that they will produce a greater honey-crop. Furthermore, non-native honeybees are unlikely to survive the wet winter conditions and are likely to interbreed with Native Irish Honeybees producing highly aggressive hybrids. We are therefore appealing to the public to support our work in conserving the Native Irish Honeybee by not purchasing and importing non-native bees into the area. Our group was founded in January 2010, by a fervent nucleus of beekeepers led by Gerard Coyne and Seán Finnerty. The association was constituted on the 14th of March 2010. A Chairman, an Honorary Secretary, an Honorary Treasurer and a Committee. The Committee is responsible for the ongoing operation of the Association during the year, and Reports back to the full Membership at an Annual Meeting. 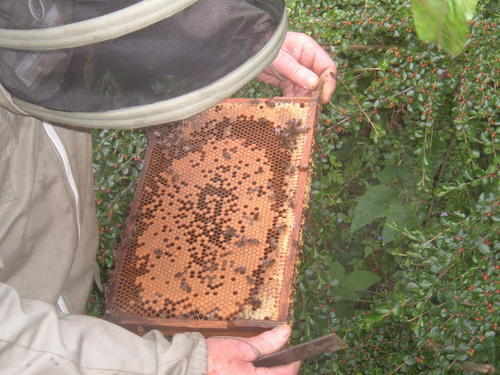 The association is affiliated to the Federation of Irish Beekeepers' Associations (FIBKA). If you are interested in joining our association, or seeking further information please contact the Secretary or PRO, through the following link. If you would like to learn more about our conservation work with the Native Irish Honeybee, or if you are interested in taking-up beekeeping as a hobby please do not hesitate to get in touch by email via the Contact Us page. We hope you enjoy your visit to our site. Please visit again at regular intervals to look at the new features and content that we are putting together. All images © Cumann Beachairí Chonamara Come see us on facebook and don't forget to like us.